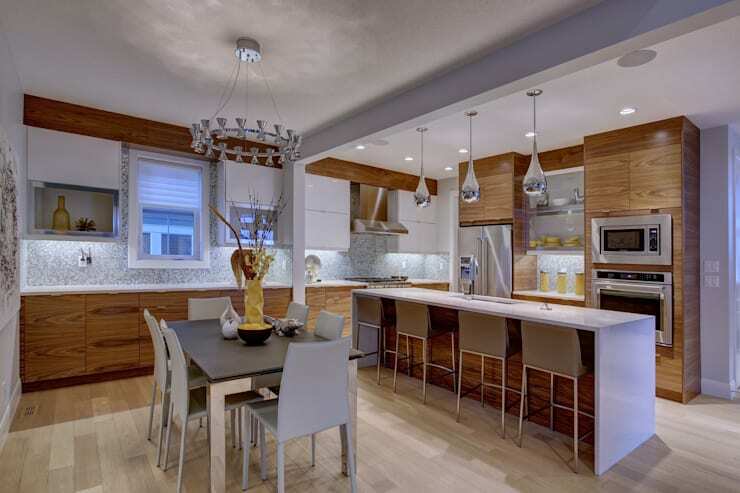 In this tour, the designers from Calgary-based Sonata Design display a luxurious interior that radiates warmth and light from every room! 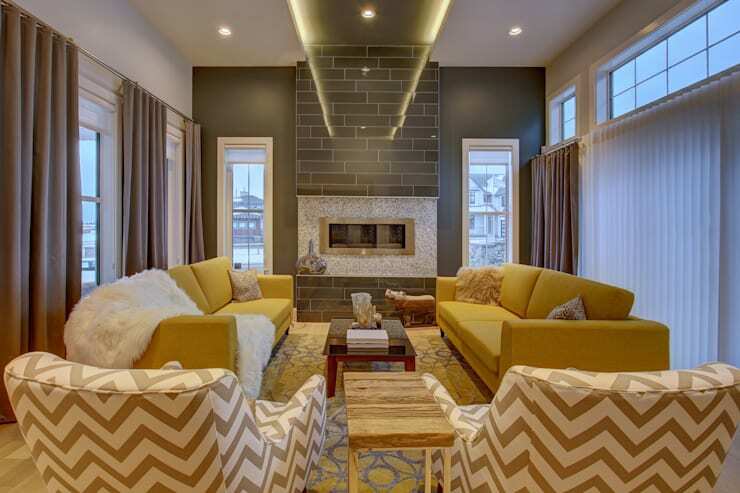 This suburban home offers a hospitable and energizing atmosphere that fluidly incorporates natural materials with the high contrasts provided by polished metals and bold geometric patterns – and the result is as eclectic as it is sophisticated! Throughout the tour, you’ll find that each room of this house has been decorated with a consideration for its sensory impact, as each space complies a rich variety of textures, from shiny steel to fluffy fur to grainy, natural wood. You’ll also find that the designers have woven a cohesive theme throughout the rooms, with hues of gold and silver creating a positive, glowing atmosphere in each space. This living room takes advantage of a simple, symmetrical layout, creating a mirror image with the furniture in the room. In this space, you don’t find just one bold, yellow couch, but two (and there’s a balanced arrangement of zig-zag armchairs to match)! With a decadent, majestic ambience fit for a modern-day Marie Antoinette, this room is full of a rich assortment of texture, from the thick fur throws to the highly polished mantle that performs an optical illusion with the ceiling as it appears to extend beyond the limits of the room. With the living room visible through a large, open frame, the kitchen maintains the same warm glow while transitioning to focus on more practical measures. 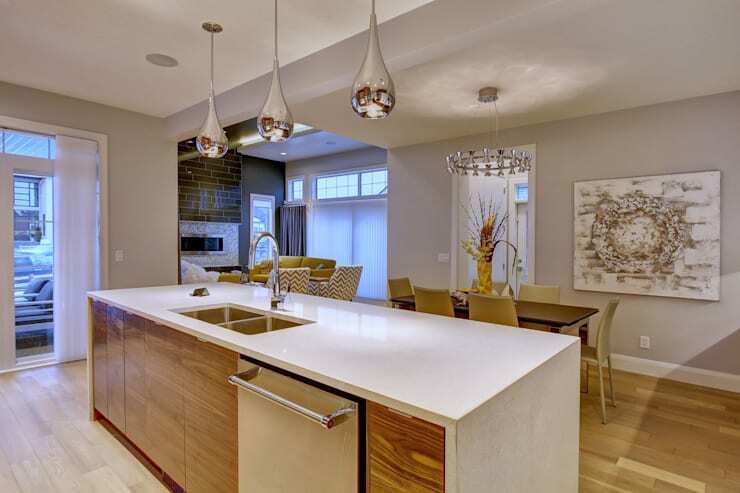 A white granite countertop provides a sleek prep surface, while a central sink establishes a convenient location. This simple, no-fuss arrangement gets a dose of glamour, however, with a trio of polished, silvery lights adding some spark to the atmosphere. The casual, kitchen dining room occupies a convenient location between the kitchen and the living room, and as the central rooms that joins the two spaces, this space works to combine themes from both. The sleek, polished theme from the kitchen is displayed in the choice of materials for the table, while the decadent, regal feel from the living room is incorporated into the tabletop decor, as well as the modern silver chandelier suspended overhead. 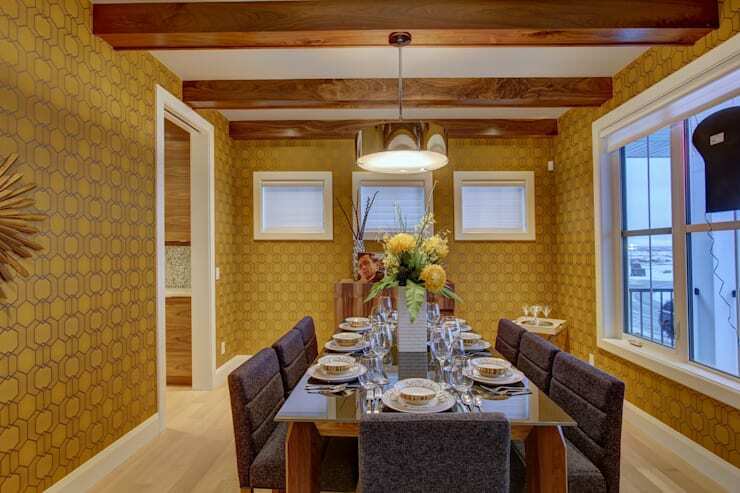 Rich with colour, this dining room creates an atmosphere that feels instantly abundant, generous, and warm. A deep golden hue covers the walls, with an ornate geometric pattern once again upping the decadent, regal factor. A traditional, linear arrangement in its own separate room, the dining space also embodies the richness of tradition. Windows let in the cool blue light from the Canadian winter, but inside, this dining room is filled with the deep richness of colour, the sensory appeal of layered textures, and an ever-present golden glow. 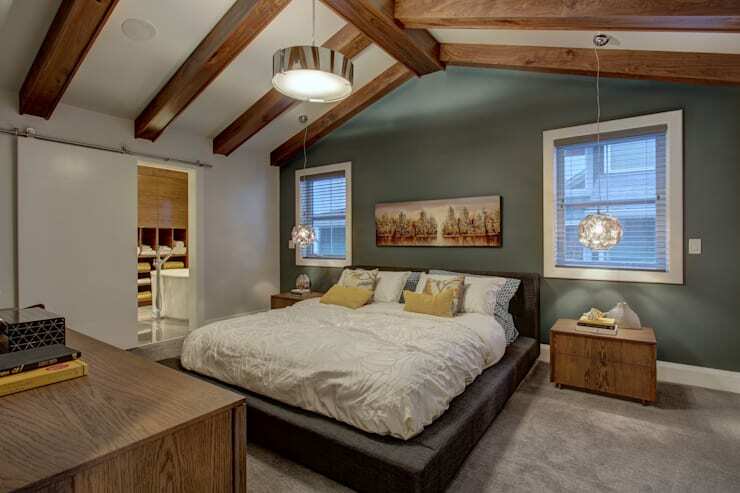 The bedroom enjoys a location under a gabled roof, with exposed wooden rafters adding emphasis to the height of the room. Natural maple finds its way into the side tables, its clear grain bringing a rustic country feel to the space. You’ll notice that this room still carries the ‘silver and gold’ theme from the main floor, with glowing orbs on either side of the bed, a silver light suspended in the centre, and a few yellow pillows contributing to the theme. 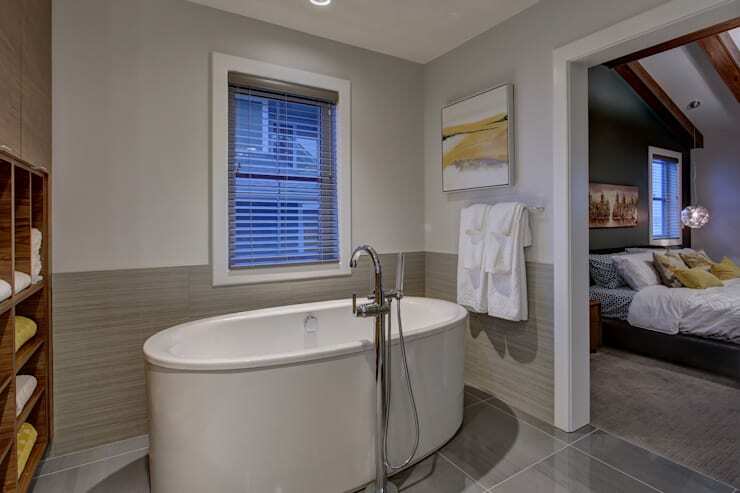 The master bedroom also features an ensuite (visible through the sliding door at the far end), complete with ample storage shelves, as well as a stand-alone tub enjoying a prime location beside the window (below). Share your thoughts on this modern gold and silver interior below!